A single game consists of 3 or 5 matches. A match consists of any number of rounds, and each round broken down into three waves. A Leader is played at the beginning of the match, and provides its bonuses passively to the entire unit. An Order is played from your hand as a one-time effect. Orders are powerful, but they go away after resolving, so saving them or using them at the right moment is critical. A Hero is played during combat using the recruit action. Heroes have different abilities based on where they stand in relation to their leader. Vanguard Heroes are those in front of the leader. These often have defensive or offensive abilities. Flank Heroes are those on either side of the leader. These usually offer improvements to their allies or tactical abilities. Rear Heroes are those behind the leader. These usually give support abilities or have ranged attacks. 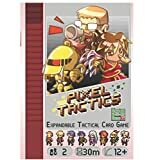 To start a match of Pixel Tactics, each player shuffles his or her deck together and draws a hand of 5 cards. He turns these upside down so that their leader sides are visible, and selects one to be the leader for his unit. Both players select their leaders secretly, then reveal them at once. The leader now forms the core of the unit, standing in the center of eight slots which may eventually hold heroes. You can see two units ready to do battle. The leader always stands at the center of the unit. 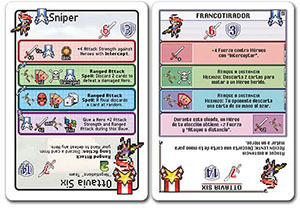 The game ends when one or both leaders are defeated (that is, they have taken damage equal to or greater than their leader life totals). Your goal is to defeat your opponent's leader before he can do the same to you. Randomly determine which player will take the first turn. This begins that player's Vanguard Wave. During a wave, the first player takes two actions, and then the second player takes two actions. Once both players have completed an action, the game moves onto the Flank Wave. Once both players complete two actions during a Flank Wave, they move on to the Rear Wave. 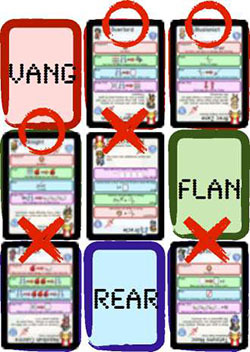 When the Rear Wave is complete, the round ends, and first player changes sides. Then a new round begins with a new Vanguard Wave, and so on, until one leader or the other falls. You just draw a card from your deck. If your deck is empty, this action is no longer available. There are no hand limits. You may play a hero down into an empty slot in the current wave (for example, during the vanguard wave, you can only recruit to empty spaces in your vanguard). You may use a hero or leader in the current wave to make an attack. Attacking is discussed in more detail later. A hero recruited during this turn may not declare an attack of any kind. A single hero or leader can only attack once per turn. You may play a card from your hand for its order (purple) effect. Read the order's text aloud and perform all the actions instructed on the card. The card then goes to your discard pile. When heroes fall in battle, they leave corpses behind on the field. These might be revived later on, but if you have no plans to revive a hero (or if you fear your opponent may revive it and use it against you) then you can clear the corpse. Simply move the corpse into your discard pile. Since heroes can only be played into empty spaces on the field, you will need to clear corpses eventually in longer battles. You may move a hero from anywhere on the field into your currently active wave. That hero cannot attack during this wave. Note that leaders cannot be moved. When you select the attack action, you will choose a hero in your current wave to make the attack, as well as a target on the opposing field. A melee attack must target the closest opposing hero or leader in a single column (see the example on the right). A melee attack does damage to the target equal to the attacker's power. All heroes and leaders are capable of making melee attacks. A melee attack cannot be used if a friendly hero or leader is standing in front of the attacking card. 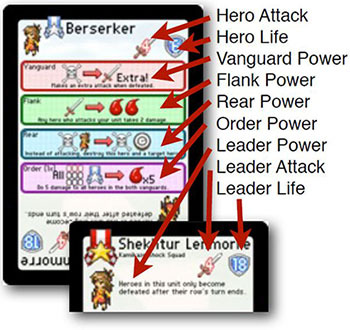 Example: Shekhtur only has a melee attack (like most leaders), so she can attack the closest hero in a column. In this case she could hit Seth, (the opposing leader), his Illusionist, or his Overlord. She would not be able to hit the Mystic, who is protected by the vanguard-row Illusionist. No matter what, heroes and leaders cannot use attacks of any kind during the first round of play. Melee attacks can only be made by the frontmost card in a column. In this example, only the cards with O's are capable of declaring melee attacks. The others (who have X's) aren't positioned to perform melee attacks. Ranged attacks can target any hero or leader, regardless of their position in the column. Cards with ranged attacks can fire over their friendly allies. Only heroes with the 'Ranged Attack' ability are capable of making ranged attacks. Ranged attacks do damage equal to the attacker's power, just like melee attacks. A few heroes have the ability 'Intercept', which means that enemy ranged attacks cannot pass over them. This makes them especially useful for protecting your rear and flank heroes, as well as your leader. Some heroes (especially rear heroes) have special powers that occur instead of attacking. For example, a hero may say 'Attack: the opponent discards a card'. 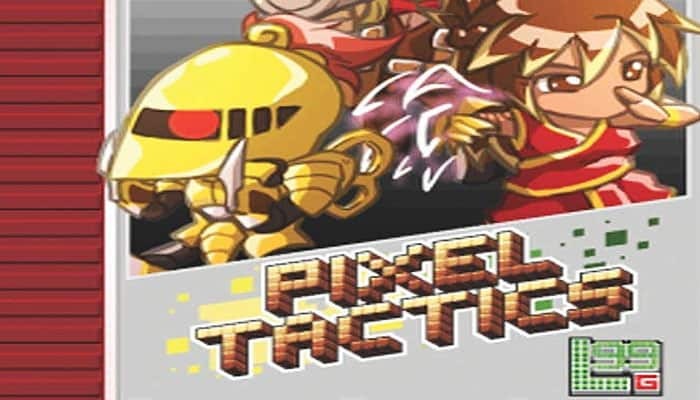 These are optional alternate attacks that can be used in place of a melee or ranged attack. They still count as attacks, so you can't use them more than once in a turn, and the same hero cannot use both their attack power and a melee/ranged attack. Attack powers do not do damage, unless they specifically say otherwise. When a hero or leader is hit with an attack, it takes damage. At the end of each wave, casualties are checked. Any hero with damage equal to or exceeding its life is considered defeated. A hero with lethal damage on it can continue to fight, act, and be healed throughout a wave. Only at the end of a wave are casualties determined. When a hero is defeated, all damage is removed from it, and it is flipped face-down, becoming a corpse. Corpses cannot attack, they do not block melee attacks, and new heroes cannot be played on top of them. Only by clearing a corpse can you play a new hero into its position. Some effects can revive corpses, and one leader can even use them to attack, so it's not always necessary to clear every hero that falls. Sometimes it's advantageous to keep them around. Example: The Gunner has a ranged attack, so he can fire over heroes and leaders. In this case, he could hit the Witch (rear right side) by shooting over Seth's Knight, or hit the Overlord by shooting over Seth himself. Seth's Illusionist has the 'Intercept' ability, and thus even the gunner cannot shoot over it. If a leader has damage exceeding its life total at the end of a wave, then the entire unit is routed, and the match ends. The player who still has a standing leader is considered the winner of the match. 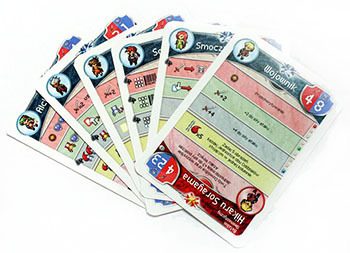 The victorious player claims the defeated leader and his own leader and sets these two cards to the side in a face-down stack to create a trophy. They will not be reshuffled back into the deck during future matches of this game. If both leaders fall during the same wave, then the army with the most remaining heroes is declared victorious. In the event of a tie here, the match is a tie. A double tie counts as a win for both players, and each player claims his own leader as a trophy. A tie cannot be used to win the game. For example, if a player already possesses two trophies in a best-of-5 game, his third trophy cannot be claimed in a tie, even if his opponent can still claim a trophy from the tie. A typical game plays best of three or five trophies--whichever number the players have agreed upon. The first player to claim two trophies in a best of three game, or to claim three trophies in a best of five game, is declared the winner of the game. If no player has won the game after claiming trophies, proceed to the next match. From here on out, both players' decks will be one card smaller. In addition, for each trophy your opponent possesses, you draw one additional card at the start of the game, before selecting leaders. This slight card advantage will give you more control over your leader selection, and give you a head start on army building. The player who won the previous match is always first player at the start of the next game.